A group of us went on a ghost tour in Charleston, SC and the guide took us to an allyway behind the Footlight Players Theatre. The story behind this allyway was, it used to be (back in the 1700-1800's) where people would come to fight. There were something like 74, give or take, documented deaths back here. So maybe these orbs are some of the souls or spirits, or maybe it's a reflection of the street light at the end of the ally. Can someone determine this for me? Souls! 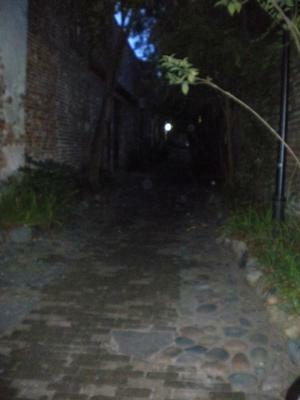 Charleston is one of the most haunted places in the United States! One of the first colonies created! So it is in my opinion that those are souls in the alley! Great pic! Look at some of these ppl down here! Look, all you have to say is your opinion, you don't have to be rude about it! You gotta a ghost picture, please lets see it! No? then go somewhere else **edited** Yes, I believe some orbs are souls, and I believe like the person who posted the pic said, maybe reflections! Sorry, to the person who posted this picture, it's a beautiful picture, but I can't say for sure if it's orbs or other matter. But I will say this last person was out of line! NO more pics of dust PLEASE!!! Unless that orb has a face and a name it's dust.. I beg to differ. This is NOT bugs, dust, particulates or a smudge on the lens. Everyone is so quick to dismiss orbs because of claims made by T.A.P.S. that ALL orbs are dust. None of these members, including Jason and Grant have any degree whatsoever, particularly not in paranormal science. It's unfortunate that followers of the show swallow everything they say as "Bible truth" and the inexperienced and uninformed accept this blanket statement to dismiss all orbs. They're plumbers by trade, not paranormal experts. Dust, pollen, bugs, you name it, but natural from this world.